In the above graphic, the green line is the slope since May 1993 without consideration of error bars. When including error bars, the range could be as low as zero as indicated by the blue line. It could also be an equal amount above the green line as indicated by the purple line. The numbers that were used to generate the above graphic are from Nick Stokes’ Temperature Trend Viewer site. Among the sillier claims made by the wind industry, its parasites and spruikers is that these things will run on the smell of an oily rag, for a quarter-of-a-century without needing so much as a shifting spanner. 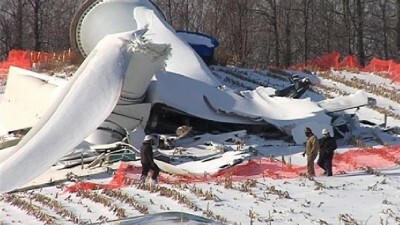 The rather expensive truth is that, when they’re not bursting into flames, throwing their 10 tonne blades to the four winds or their 290 tonne hulks are being splattered over paddocks and roads, their blades and innards disintegrate within a few short years; requiring wholesale replacements of gearboxes, blades and bearings. Climate Crisis Inc. strikes again. About 10 per cent of the city’s working population is employed by Arrium. Mr Sowerby said the city of Whyalla, which has a population of about 22,000, would be devastated if the steelworks shut. 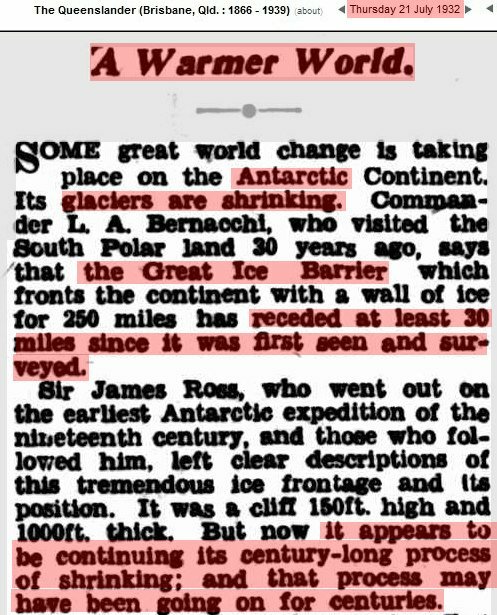 Experts say that global warming will make the West Antarctic Ice Sheet collapse in 250 years, and it is your fault! Thirty-five years ago experts said it would happen in only 200 years. Apparently they have granted Earth an 85 year long reprieve. Besides the fact that they are incompetent and plagiarizing prior research, they are also lying. Scientists have known for 40 years that it has nothing to do with the climate. It is bad enough that they are lying about the cause, but they are hiding the fact that this process has been going on for nearly 200 years, and possibly much longer.